These powerful dragons wrap their wings around the glass. When placed together they nuzzle and form a heart in the space between them. Crystals cast into the molten pewter shine from their eyes and amongst the rocks they perch on. We make them by hand from lead-free pewter, crystals, and fine glass. 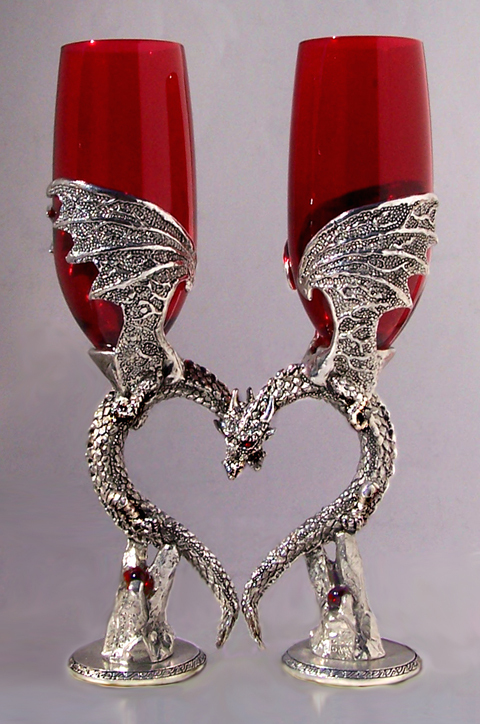 They are sold as a pair, and each dragon holds 8 ounces. *(Our color options below are listed with glass color first and crystal color second.) ** For our life-long GLASS REPAIR GUARANTEE go to "Cleaning & Glass Repair" near the top of our home-page.